The girls are laying. The rain has fallen. Everything is right with the world. This morning Ms Tagalong squeezed into the garden past all the verdant growth and had to let out the chickens although it wasn’t her turn. They were very vociferous, indignant even, at letting even the shortest micro-second of daylight pass without them being outside the coop. Scrabbling to get out, the heaped through the door and fell out, racing toward a bountiful heap of scraps that some kind soul had posted over the fence. They scratched and clucked, tossed and rummaged. Ms Tagalong’s keen eye spotted some eggshells amongst the pickings and thought a moment of education was in need. The chickens will eat their own eggs if they get into the habit so it is wiser not to put the halved eggshells in whole, if you take Ms Tagalong’s meaning. Best recipe is to bake them in the oven when you are baking something else on a low light and then crush them as finely as possible and chuck over the fence for them to scratch at. Hey presto, our very own grit without any expense! p.s. if you are wondering why there is the Great Fence of China erected between the smaller and larger run it is because Ms Tagalong has sowed some green mulch seeds for the girls and our black wonder (chicken not sheep) keeps flying over and tasting the protruding seedlings. Not yet! Every community has a black sheep! Probably you have heard whispers of black sheep in the family since you were knee-high! We don’t talk about Uncle Dirk. Don’t mention cousin Hattie and don’t even whisper whatever happened to Joe? The shame of the black sheep. Every family of landed gentry has a wayward son or daughter who may or may not sing the nursery rhyme. Well, a few weeks ago the not so distant sound of bleating reached Ms Tagalong’s ears. She knows that Tighes Hill is becoming a village, not just a community but…She opened the front door to be greeted by two young garden poets and a black sheep on a lead. And that’s how she knows every community has a black sheep! Ms Tagalong had waited many moons to be able to replicate this initiative she had seen in Bridport,Dorset last year and here it was. 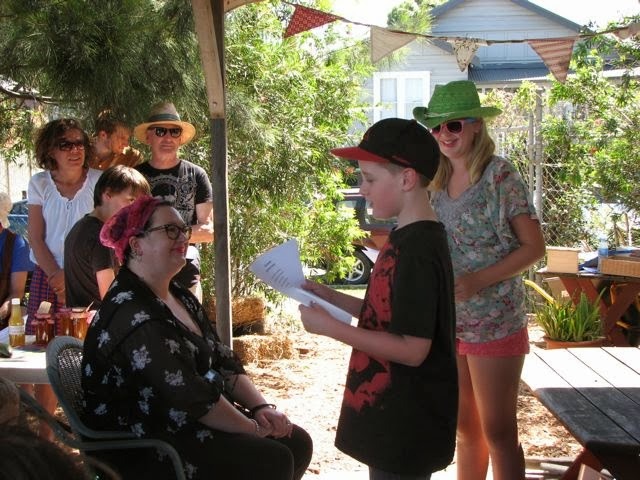 Bright-eyed and bushy-tailed young poets from the local Tighes Hill Primary School took part in the Community Garden Open Day. It was too hot for the poets to stand and recite in the gardens amongst the veggies and flowers but they stood amongst the watering cans under the pergola and spoke of bugs and butterflies, hummingbirds and bees. Under the wings of a kind heartYou will find a secret. Do you want to know what secret it is? The secret of a sparkley butterfly. So keep your kind hearts, gardeners. Massage that kale like Sven! It was an amazing Open Day. From beauty products to wick beds, there was something for all. ‘You must massage it strongly, you know Sven-like!’ said Michelle from Embrace Family Nutrition as she demonstrated how to bully the somewhat tough kale into submission. Having cut out the ribs and chopped it finely it was now being squeezed to within an inch of its life before the other ingredients were added. Ms Tagalong was all ears. She had been reading how kale and quinoa were trending on Twitter! Mmm, well maybe not but they are certainly popular at present. And this was Michelle’s recipe as made by Sarah Britton for a delicious kale salad which everyone tasted and came back for more. 4. Assemble remaining salad ingredients and dressing. Toss and serve. 5. This can stay in fridge for a few days as is already wilted!